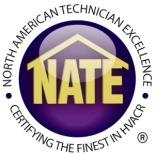 As of May 2013 all non-weatherized gas furnaces (furnaces installed inside your home) and mobile home gas furnaces installed in the northern half of the United States must have a minimum AFUE of 90%. This includes Colorado. AFUE means -Annual Fuel Utilization Efficiency- it is the measurement of how efficient the appliance is in converting the energy in its fuel to heat over the course of a typical year. Your heating contractor can help you save money on home heating in many ways. By maintaining your heating system’s efficiency, ensuring healthy indoor air quality and making sure it is vented correctly and efficiently you will be on your way to saving money on your heating bills.